View More In Bathroom Safety, Aids & Accessories. The Vive freestanding toilet safety handrail is a bathroom safety product designed to assist people with disability, seniors, handicapped and elderly. This independent living aid is an investment your independence. It easily fits around most toilets to provide the user with a sturdy support that makes sitting down and standing up safe and easy. Its armrests are padded for comfort and Its freestanding design makes it easy to remove and store as needed. Stands on the floor for easy installation. 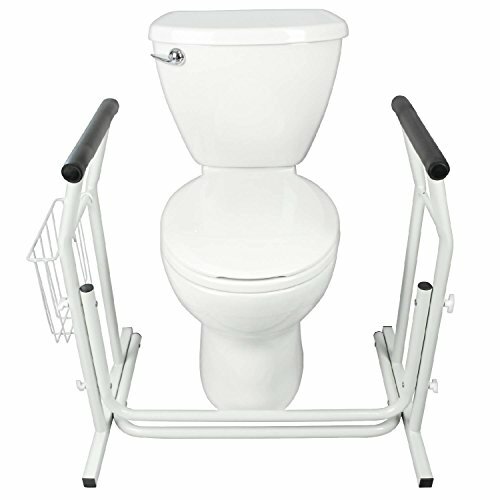 SIT AND STAND SAFELY: Supporting up to 300 pounds, the sturdy, stand alone toilet rail conveniently provides safety and security when sitting down or standing up in the bathroom. Perfect for the elderly, handicapped and for those recovering from injury or surgery, the rail prevents slips and falls for additional peace of mind. EASY TOOL-FREE ASSEMBLY: The freestanding toilet rail is easy to assemble: no tools required. Handles can also be easily removed for convenient storage. Lightweight and durable, the frame is corrosion resistant, perfect for long term use. COMFORTABLE NON SLIP HANDLES: Rail handles are padded with a soft foam for pain-free support. The foam padding creates a comfortable, non-slip surface for a secure grip when sitting or standing. Handles and frame are also easily cleaned by wiping down with a standard disinfectant solution. VERSATILE STANDALONE FRAME: Safety rail base is a wide 26.5", easily fitting in smaller bathrooms. Freestanding safety rails can be used with standard and elongated toilets or at the sink or vanity. The bottom rails are 19" deep, adding tip-proof stability to the frame. VIVE LIFETIME GUARANTEE: Unconditional lifetime guarantee so you can purchase now with confidence. If you have any questions about this product by VIVE, contact us by completing and submitting the form below. If you are looking for a specif part number, please include it with your message.